Not to be confused with the neighboring province of Shanxi. Shaanxi (Simplified Chinese: 陕西; Traditional Chinese: 陝西; pinyin: Shǎnxī; Wade-Giles: Shan-hsi; Postal map spelling: Shensi) is a province of the People's Republic of China located in the middle part of the country. Due to this central position in China's interior, the province is landlocked and shares borders with eight provincial areas of China. It borders the autonomous region of Inner Mongolia to the north, the Ningxia autonomous region to the northwest, Gansu to the west, Sichuan to the southwest, Chongqing municipality to the south, Hubei to the southeast, Henan to the east, and Shanxi to the northeast. The provincial territory includes portions of the Loess Plateau in the middle reaches of the Yellow River, as well as the Qinling Mountains, which stretch across the southern part of the province. According to Hanyu Pinyin rules, if tone marks are not written, both Shaanxi and the neighboring province of Shanxi should be spelled "Shanxi." However, the difference comes from the pronunciation tone: Shānxī and Shǎnxī. To make this difference clear without tonal marks, the spelling "Shaanxi" was contrived (following the romanization system of Yuen Ren Chao) for the province of Shǎnxī, while the spelling "Shanxi" has typically been used for the province of Shānxī. Shaanxi constitutes one of the origin sites for the Chinese people and civilizations. The oldest Neolithic village has been excavated in the province, and the archaeological recovery of artifacts from ancient Chinese dynasties provided important looks into China's past. Land-locked, and far removed from the prosperity of the Gold Coast of China, Shaanxi has been slower to develop than most Chinese provinces. The future looks bright for economic development and a comfortable standard of living with abundant water resources, mineral and metal deposits, and excellent farming land. Shaanxi, together with its capital city of Xi'an is considered to be one of the many points where Chinese civilization first developed. A total of thirteen feudal dynasties established their capitals in the province during a span of over 1,100 years, starting from the Zhou Dynasty all the way to the Tang Dynasty. Shaanxi is also notable as the starting point of the Silk Road, which served as a trade route, leading from China to Arabia, into Europe, and eventually ending in Africa. Under the Ming dynasty, Shaanxi was incorporated into Gansu but the two areas were later separated during the Qing dynasty. One of the most devastating earthquakes in history occurred near Hua Shan, in the south-eastern part of Shaanxi province on January 23, 1556, killing an estimated 830,000 people. During the early part of communist influence in China, Shaanxi played a significant role as a base of operations for the Chinese communist party. After the end of the party's short-lived Jiangxi soviet, the communists were forced to flee by the Nationalist forces, which signaled the beginning of the Long March by Mao Zedong and the rest of the Chinese Communists to the Shaanxi soviet, which was located at Yan'an. Shaanxi has varied topography, with large areas of desert in the north running along the border with Inner Mongolia. The Loess Plateau is located in the central part of the province, and the Qinling mountains run from east to west in the southern part. The Loess Plateau in the north has an elevation of 800-1,300 meters, and accounts for roughly 45 percent of the total area of the province. The Central Shaanxi Plain in the middle of the province has an average elevation of about 520 meters. The Qinling and Daba mountainous areas in the south include the Qinling Mountains, the Daba Mountains, and the Hanjiang River Valley, and they account for about 36 percent of the total area of the province. Shaanxi also has a complete water system that runs throughout its land area. 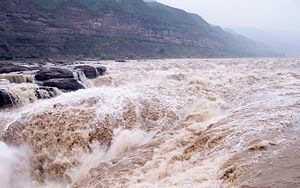 North of the Qinling Mountains is the Yellow River system, which is composed of the Weihe, Jinghe, Luohe, and Wuding rivers. South of the mountains is the Yangtze River system, which consists of the Hanjiang, Danjiang, and Jialing rivers. The Hanjiang River, which is the largest river in the province, provides more than half of its total water runoff. The northern part of Shaanxi is cold in the winter and very hot in summer, with dry winters and springs. The southern portion generally receives more rain. The average temperature annually is roughly between 9°C and 16°C, with January temperatures ranging from −11°C to 3.5°C and July temperatures ranging from 21°C to 28°C. 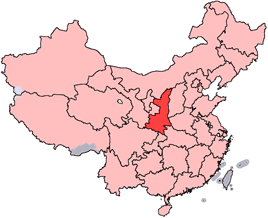 The eight prefecture-level divisions of Shaanxi are subdivided into 107 county-level divisions, including 24 districts, 3 county-level cities, and 80 counties. These county-level divisions are then further divided into 1745 township-level divisions, resulting in 917 towns, 680 townships, and 148 subdistricts. Largely due to its landlocked nature and distance from the more prosperous coastal areas of China, Shaanxi has a relatively less developed economy, which focuses mostly on agriculture and other raw resources. Northern Shaanxi is a prominent farming and pastoral area which grows millet and corn, and contains vast areas for developing forestry and animal husbandry, especially sheep, cattle, and donkeys. The Guanzhong Plain, with its long reclamation history and highly developed agriculture, is also one of China's best-known wheat and cotton growers. Shaanxi has healthy levels of mineral deposits, including coal, mercury, molybdenum, gold, and more than 80 other kinds of minerals. The province also has some value as an energy resource base, with the Shenmu and Fugu coal fields in northern Shaanxi holding a total reserve of more than 160 billion tons of quality coal, containing extra low sulfur, phosphorous, and ash contents. In addition, a sizable reserve of natural gas has been found in the province, and its potential remains largely untapped. Shaanxi's nominal GDP for 2006 was 438.4 RMB ($56.7 billion USD) and GDP per capita was 11,762 RMB ($1,516 USD). The provincial economy ranked twenty–second in the entire People's Republic of China. Shaanxi is unique in that it provides an interesting blend of the old traditions of ancient China with the strong new tradition of both Chinese communist revolution and Chinese democratic revolution. It is culturally significant for its loud and resounding Qinqiang form of opera, the clattering of gongs and drums, and its famous artwork, especially paper art and peasants' paintings. 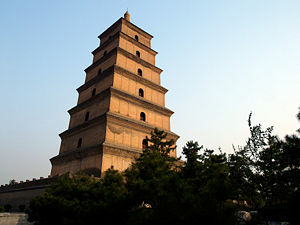 As one of the oldest areas of Chinese civilization, there are numerous tourist sites in Shaanxi. One of the oldest is the Banpo village remains near Xi'an, the site of a 6,000-year-old village dating back to the Neolithic Age. The city of Xi'an itself houses many notable tourist attractions, including its famous city walls built during the Han Dynasty which now serves as the largest and most well-preserved ancient wall in the entire country. In addition, the city houses the Forest of Stone Steles Museum, which boasts the largest collection of stone tablets in all of China. Many of these tablets are engraved with "classic" texts of Chinese culture, which make them an even more important sight for tourists visiting the province. While those sites all have rich historical significant, the Mausoleum and Terracotta Army Museum of the Qin Dynasty represents the most important site in Shaanxi. Located in Xi'an, the Mausoleum and Terracotta Army Museum has been named as a World Heritage Site. 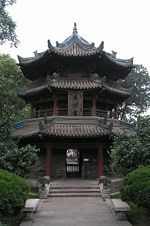 Other notable sites in Xi'an include the Great Mosque, its famous Bell Tower and Drum Tower, the Shaanxi History Museum, and the Wild Goose Pagoda. Along with some of Shaanxi's historical monuments, it also hosts several notable natural sights, including Huashan (Mount Hua), one of the five most famous mountains in China; Taibaishan (Mount Taibai), the highest peak of the Qinling mountain range; the Hukou waterfall, which is the second biggest waterfall in all of China, and the city of Yan'an, which served as the destination of the Long March and the center of the Chinese Communist revolution from 1935 to 1948. Nearly all of the people in Shaanxi are ethnic Han Chinese, accounting for 99.4 percent of the total population. However, the province does contain pockets of Hui people in the north western region (adjacent to Ningxia), and is also populated with other minority groups including Mongols and Manchus. The southern part of Shaanxi, known as Guanzhong, where the provincial capital Xi'an is located, has a higher population density than the northern part. Due to a variety of historical reasons, the average education level of the population in Shaanxi remains relatively low. By the end of 2000, the province only had 39 higher education institutions, with a total student enrollment of 241,700, and 20,723 teachers. At the pre-collegiate level, there were 3,247 secondary schools with 2,668,900 students enrolled and of 143,972 teachers, and 33,336 primary schools with 4,809,300 students and 182,297 teachers. Education at the primary school level is fairly well developed, with 98.59 percent of primary school-aged children attending school. However, this success has not seemed to carry over into the secondary level, with only about 69.49 percent of junior high school graduates continuing their studies into high school and beyond. Shaanxi Radio serves Xi'an and the surrounding areas with music and news. Zheng, Yi, T. Paul Schultz, and Deming Wang. Association of divorce with socio-demographic covariates in China analysis based on data collected in Shanghai, Hebei, and Shannxi. Durham, NC: Duke University Center for Demographic Studies. This page was last modified on 10 September 2015, at 19:32.